You are here: Home / BLOG / Uncategorized / Anybody read Chinese? A friend of mine in California was given this baggie full of fiber. The purchaser’s husband thought he was getting a package of rubber gloves, and was quite surprised to find the wad of fluff inside. She says it looks like cotton, not like silk. It is short-stapled, not shiny, with bits of what appear to be vegetable matter. I’m wondering if the labeling on the package would clarify. I’m thinking it may be silk noil. I’m curious what it’s bagged up like this for – it doesn’t look like it would be for spinning, in an amount like this – maybe it’s for some household use? Is silk fluff used like cotton balls, for wiping off makeup, etc.? The two characters on the left-hand side of the second line mean “silk,” and the same characters are in the middle of the green band at the bottom. But, that’s as far as my Chinese-character-recognizing skills go. Can any of y’all give me a hand? 0 0 Michael Michael2007-06-28 15:11:002007-06-28 15:11:00Anybody read Chinese? I grabbed the picture and I’m asking one of my friends via email to see if she can help. Otherwise maybe someone else here can? Hey, my mom says it’s silk fill/batting. It’s the same word as they use for the stuff in jackets or blankets. It *is* silk, though. I don’t read chinese but the silk worm munching a mullberry leaf picture would seem to me to be a symbol for silk. any thoughts on a transation of the label? 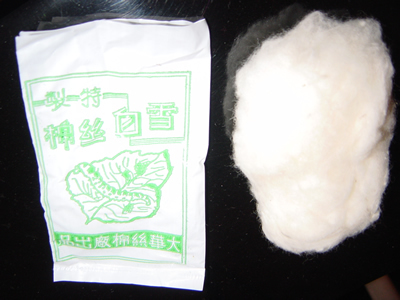 “cotton” here meaning the fluffy material used for stuffing and batting in things like jackets and blankets. “Da hua” means “Great China” and it’s just the company name. I was hoping the label text might explain why they’d package it in tiny bags, but I guess that gets to remain a mystery. It seems like you’d need dozens of bags to make something like a jacket. I haven’t seen it in person, but from what my friend’s describing, it’s not a lot of stuff, like an ounce or less. Yeah, no explanation. It might be a small pack for repairs is what I’m thinking. Y’know, yer jacket springs a leak or what have you. Stuff’s not particularly cheap. The jackets filled with silk are a lot more expensive than the ones with cotton, and now it’s common to find ones filled with polyester batting. *laughs* That’s what I was thinking. It is raw silk. The big character means Snnow White Silk. The two character above it says “Special Made”. The line at the bottom is the company name. It wasn’t exactly a gift… my friend Pam got the silk, because her friend’s husband bought it, thinking he was getting a package of disposable gloves. So Pam’s friend gave it to her, knowing she’s a fiber-arts person. It wasn’t like a put-a-bow-on kind of gift. But, very cool nonetheless! Nothing like a “have some silk” gift from out of nowhere. Exactly! Although, I have to admit I’d be somewhat frustrated if I bought a bag that I thought was full of rubber gloves, and it turned out to be full of silk fluff – silk is always a pleasant surprise! Ah, I can see that. As you may know, I am a Chinese guy. I think the text on tha package was written from the wrong direction. It should have been written from left to right. The first character on the right on the top row means “special, specially”, the second character means “manufactured”. The first character on the second row means “snow”, the next character means “white”, the third character means “silk” and the fourth character means “cotton”. The last row of characters represents the manufacturer’s name. Nope… it’s silk fluff, waste from the reeling process. But thanks for the info!